Pesaro (95,000 inhabitants circa) is the main city on the northern Marches coastline, as well as being the capital of the Province of Pesaro and Urbino. The Foglia River, which has its source on the alluvial plains, at the end of its course empties into the Adriatic Sea at Pesaro, where it forms a small delta. The city is situated on the low sandy coast and narrows in the north and south, where two reliefs meet the sea, one on either side: St. Bartolo Mountain and Ardizio Mountain. Tourism accounts for some of the economic activity of the city, but the most important industry is furniture making (the so-called kitchen district) and the manufacture of machinery. The main industrial areas are located on the alluvial plain along the course carved by the Foglia River. The Foglia River has its source at Mount Sovera, near to Sestino (in the province of Arezzo) and its main course runs for 79 kilometres, ending in Pesaro. Its catchment basin measures 628 Km² in all, of which 603 is mountain basin. The river’s course has a SW-NE flow as it crosses the Province of Pesaro at right angles to the tectonic structures, with a brusque deviation when it reaches the internal side of Montecalvo in Foglia. The presence of geological formations composed primarily of marble, sandstone and clay, account for its low to medium permeability values. The wide range of the fluctuating water levels it carries are directly linked to area rainfall amounts. The maximum flow levels are a phenomenon typical of spring and autumn, while during the summer or in periods of drought, the river’s flow registers its minimum values. 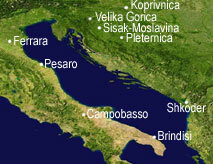 The highest current speed ever registered in Pesaro itself was 1,830 m³/sec in 1955. Episodes of overflow in the past were due, to a great extent, to sections of the river course with reduced flow capacity, which were unable to efficiently conduct the excess water brought about by episodes of exceptional rainfall. The modern day mouth of the river is the result of land reclamation activity dating to 1613-1615. On the alluvial plain itself, the river’s flow meanders in the wide loops typical of rivers on almost flat land and with a low incline factor. The course of the river is interrupted by an important man-made basin, the Mercatale irrigation damn. The city of Pesaro, where the river system is an integral part of the urban structure, considers the problem of hydro-geologic safety, as well as the safety of its citizens and the land which can be put at risk by an over-flow of the river, an important aspect of its duty. At the same time, however, issues regarding the use of the river for recreational purposes are also central to the qualification and sustainable use of the resource. The work group, in the meantime, is dealing with these two aspects of the problem of rivers, in contrast with one another but which must be seen as complementary one to the other, in an integrated manner. Information regarding the projects has been made available on a website created for this project.